Digestion is a complex coordination of interactions between mechanical, chemical, and neurological activity, and aging can alter the function of each of these activities. The gastrointestinal tract contains the greatest number of immune cells and is also home to the enteric nervous system (ENS), the largest and most intricate organization of neurons outside the central nervous system. 2 As we age, each organ associated with digestion experiences changes that are a natural part of aging, but which impact overall digestive function. Next, the reflex response of swallowing propels the bolus of food into the esophagus, where it very quickly progresses toward the stomach with the help of voluntary and involuntary muscle. The involuntary, or smooth muscle, is stimulated by cholinergic nerves which initiate the wave-like motion known as peristalsis. The initial act of swallowing stimulates a drop in pressure at the distal end of the esophagus, relaxing the gastroesophageal sphincter and allowing the bolus of food to pass into the stomach. The stomach has its own series of chemical, hormonal, and mechanical processes. Gastric juices are released, and multi-directional smooth muscles mix them together with the food resulting in a part liquid/part solid mass known as chyme. The primary players here are hydrochloric acid (HCL), intrinsic factor, and the enzymes alpha-amylase, gastric lipase, and pepsin—an enzyme responsible for hydrolysis of proteins. The acidic chyme is then moved through the stomach by wavelike contractions, pushing it toward the pyloric sphincter, where gastric emptying into the small intestine occurs. The lumen of the small intestine is lined with mucosa, a membrane layer that serves as a site for nutrient absorption as well as endocrine, enzyme, and immune cell activity. This mucosa is also colonized with intestinal microbiota. Once absorption of nutrients is completed in the duodenum, jejunem, and ileum of the small intestine, the remaining unabsorbed food material passes through the ileocecal valve and enters the large intestine. 3. Remond, Sharar, Gille et al. 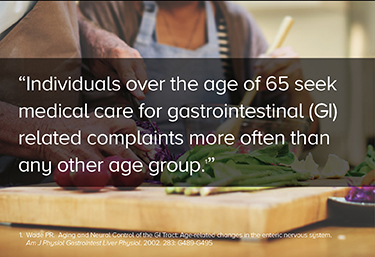 Understanding the gastrointestinal tract of the elderly to develop dietary solutions that prevent malnutrition. Oncotarget. May 2015. 6(16). 4. Keller J, Layer P. The Pathophysiology of Malabsorption. Viszeralmedizin, Gastrointestinal Medicine and Surgery. 2014. 30: 150-4. 5. Andres N, Noel E, et al. Vitamin B12 (cobalamin) deficiency in elderly patients. CMAJ. August 3, 2004. 171(3): 251–259..
6. Mabbot NA. A breakdown in communication? Understanding the effects of aging on the human small intestine epithelium. Clinical Science. 2015. 129: 529-31. 7. Biagi, Nylund, Candela et al. Through Ageing, and Beyond: Gut Microbiota and Inflammatory Status in Seniors and Centenarians. PLOSone. May 2010. 5(5). 8. Saffrey, JM. Cellular changes in the enteric nervous system during aging. Developmental Biology. 2013. 382: 344-55. 9. Phillips, RJ, Powley, TL. Innervation of the Gastrointestinal Tract: Patterns of Aging. Auton Neurosci. October 30, 2007. 136(1-2): 1-19.